My friend and I arranged the trip in the form of a package tour, which was a good purchase. It was a 120 dollar night plan with half board including a round trip train ticket. We stayed at a ryokan (a hot spring inn) in Izusan hot spring (伊豆山温泉), one of spas in Atami City. 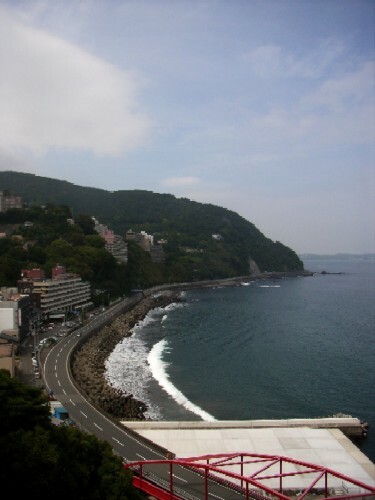 Izusan area lies about 2 km north of Atami spa along Route 135 by the ocean. The hot spring is famous for the fabulous view to the Sagami Bay and its wealth of hot spring water. While bustling Atami spa has a concentration of hundreds ryokans and hotels, Izusan has quiet and relaxing atmosphere. 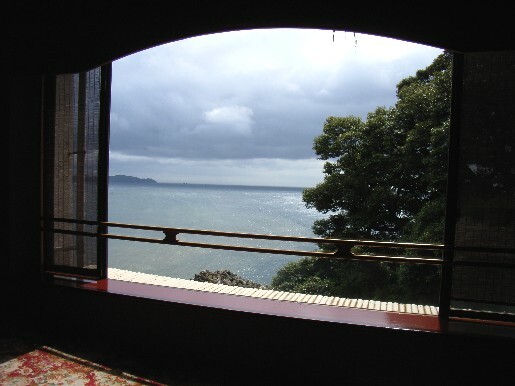 I knew of the famous ryokan overlooking the sea. Among small-scale inns in the area, Suiyo-tei that has 79 rooms is relatively large. It was a high class and expensive ryokan in Showa Era. A standard ten-mat room with a sitting area was assigned to us. The picture below is the nice ocean view from our room. The building shows signs of age, but the room was clean and in good condition. There are three public spa & bathing areas in the ryokan. The main one, which has countless large hot tubs, is largest in Japan at approximately 20,000sq. ft (550坪, the left picture). The outdoor hot tub area has large tubs overlooking the sea, and there is one more spacious area. Three private baths are also available (the right picture). I stayed at many hot spring inns, and I can tell you that Suiyo-tei’s spa & bath facilities are five times more than those of a ryokan in the same scale. I have mixed feelings about the ryokan. The scale of spa & bathing areas should be adequate both for number of guests and to maintain good hot spring water in a bathtub (fresh and clean). Suiyo-tei has seven hot springs, which is abundant. However, its spa facilities are far, far too big for a 79-room ryokan. In a large bathtub, water must be filtered and circulated for hygiene control. I confused if it was really hot spring water in the large bathtubs, no one used most of them, because it already lost spa water tastes. I spent much time in the private bath because I heard pure hot spring water was used in the private one. The water was better than that of the public areas, but I couldn’t feel rich spa water tastes. I think the ryokan degrades its spa water to fill needless bathtubs. If the ryokan modifies its spa facilities to fit the number of guests, I‘ll be able to lie in nice hot bath with brilliant hot spring water it originally has.